I again woke up rather early as I had my morning planned out and I needed to get moving. My first stop was to purchase gas and I came to the realization that a Jeep Wrangler has a huge gas tank. I also grabbed something for breakfast. My next stop was to Walmart. I needed to buy a towel and I ended up getting some water shoes and a water resistant box. I didn’t know exactly the situations that the ATV riding would get me in to. This Walmart was just like any other Walmart except with Hawaiian flair. I made my way up to the Waipi'o Valley as the meeting location for the ATV tour was at the Waipi'o Valley Artworks. The tour operators arrived and we rode in their van back to their operations site. After getting outfitted with a helmet, goggles, and a bandana (for keeping out the dust) we were given a demonstration on how to use the ATVs and instructed to test drive them on a small track. Then we were off. We rode through the Eucalyptus forests which were majestic. This section of the tour was extremely dusty and I was thankful for the goggles and bandana. 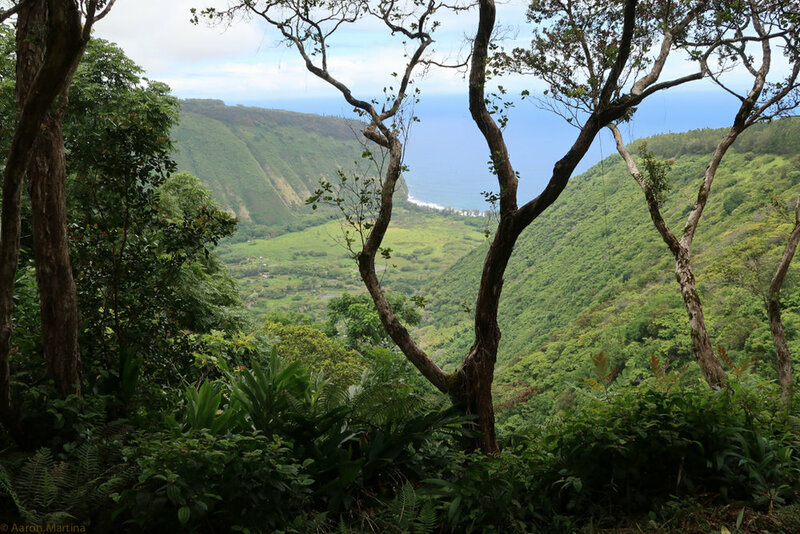 We stopped for a short break on a cliffside overlooking the the Waipi’o Valley which is historic farmland for this Hawaiian island. One of the guides (I wish I remembered his name) gave a very informative and emotional speech about Hawaii, the culture, and the significance of this land and valley. 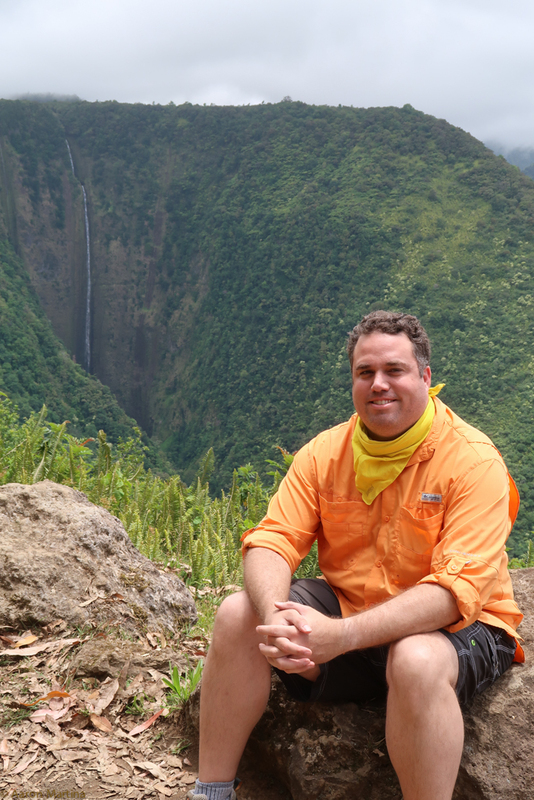 We then mounted our motorized steeds and traversed the trails again until we reached the midpoint of the tour which was top of the Hi’ilawe Falls. Here we stopped for a swim in a pool in the Lalakea Stream which feeds the falls. 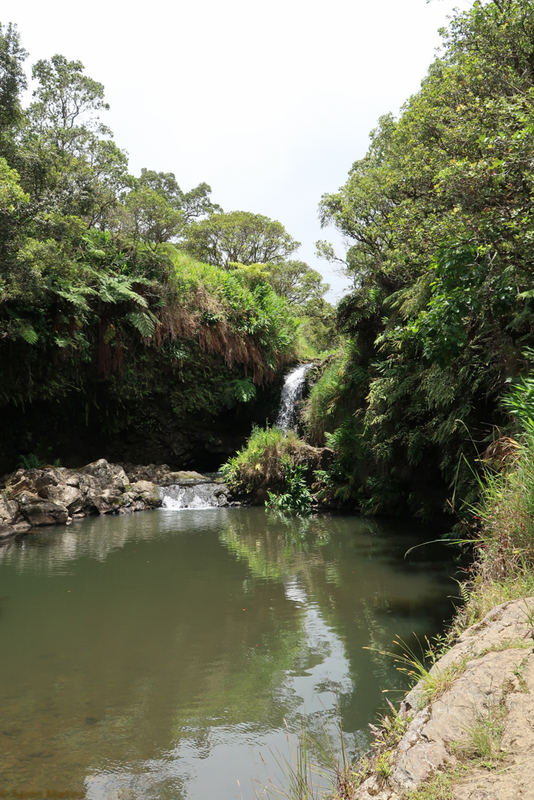 This pool is on private property and is considered a sacred location by the local Hawaiians. The water was cold but not unbearable. We had a small snack while drying off and then we jumped back on the ATVs for the trip back down the mountain. We made another stop at an overlook that had a much better view of the Waipi’o Valley as well as the falls. They had me pose for some photos. The entire tour was a blast and I highly recommend the Waipi’o Ride The Rim tour. After I parted company with the tour and I was back in my own vehicle I drove to the official Waipi’o Overlook and took a couple of photos. At this point I was getting really hungry and based on a recommendation by a local friend I went to Tex Drive In & Restaurant. It was located just outside of Honoka’a which was the hippiest town I have ever encountered. It was as if the 60s had arrived and then time had stopped. I had a teriyaki burger which was really good and then I had two malasadas. I probably should have had only one but it was recommended that I get one with a filling so I got three total (one I saved for the next day). Those were really good and I’ll have to find some place in the lower 48 that is closer and makes those. After my late lunch/early dinner I went exploring around this northern area of the island. My first point of interest was Keokea Beach Park which apparently is big with surfers but I didn’t see any out there when I was there. There were a couple of ladies picking up rocks or sea glass from the beach and a man in dreadlocks spinning ambient techno music from the pavilion that overlooks the park. It was a surreal experience but I think this was one of my favorite locations on this trip. My next stop was Mahukona State Park which used to be a sugar company’s harbor but now seems to be a gathering place for locals. I felt out of place as everyone there was drinking and having fun. I doubt they cared about my presence but I didn’t stay long and moved on to someplace more comfortable for me. My last exploration spot was Kaiholena which is a secluded cove that requires a 4x4 to drive down the the “parking” area and then another quarter of a mile to get down to the water. But I was treated to an amazing site on the eastern side of the island as the sun began to set. As the sun set I traversed my way back to my vehicle and then back to the highway where I drove back close to my hotel. I have a tradition of seeing movies every week and I decided to go see Alien:Covenant at the local Regal before I went back to my hotel for the night. It was decent. I took it a bit easier on this day. I had a plan to meet up with some of my fellow divers after they finished the ATV tour that I had taken on the previous day. So after grabbing breakfast at the hotel lounge I meandered up to Waimea just before lunch time. I could see Maui on the drive up. While I waited to hear from them I checked out the Waimea Nature Park (‘Ulu La’au). This was a neat little nature preserve with some gardens and a trail. As lunch time arrived I still had not heard from my friends so I sought out a place to eat and I came across Hawaiian Style Cafe which was amazing. I think I had the Korean Pork and the Kalbi Ribs but I can’t recall exactly. I just remember it being awesome. Just as I was finishing my lunch I heard from my friends and after I finished I met them at the Big Island Brewhaus. I didn’t have anything here other than water as I was satisfied sufficiently with my lunch but I enjoyed the company after being on my own for many days. 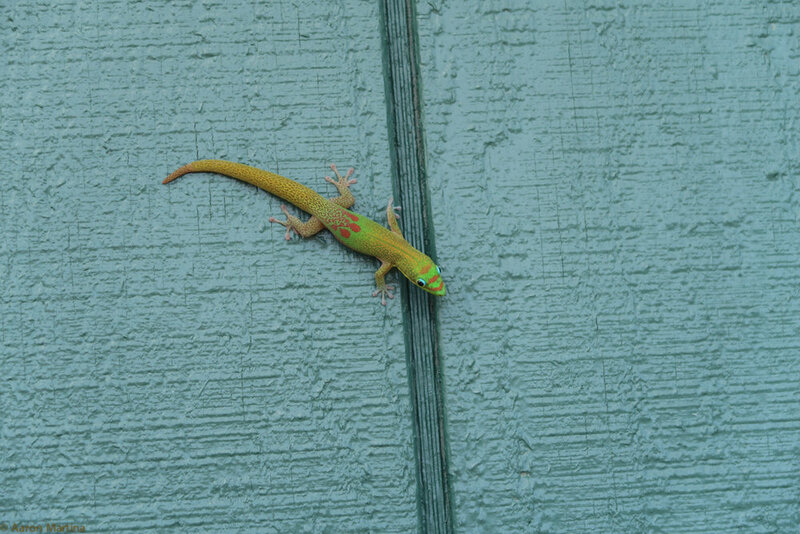 We were also visited by a gorgeous gecko. After spending time with my friends I attempted again at getting to the top of Mauna Kea but this time I actually went into the information center and talked with someone. They stated that I couldn’t go as I didn’t have at least a half a tank of gas in my vehicle (I had about a quarter of a tank). Too much playing Ingress throughout the day I guess. I just went back to the hotel after that and ended the day. I woke up a bit later and again partook in breakfast in the hotel lounge. I decided that I was going to explore the south western portions of the island. After refilling my jeep I started down the road taking any exits that seemed to head down to the ocean. 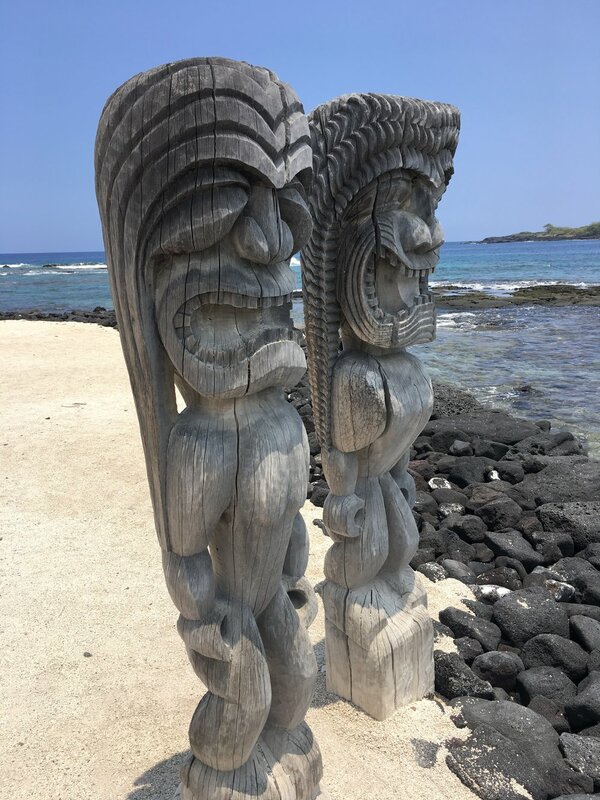 My first stop was Kealakekua Bay State Historical Park which seemed to be a very well maintained state park. As I pulled into the parking area a man approached me trying to rent me a kayak and provide guiding services. It seemed very sketchy so I declined and checked out the park. There were signs talking about the park and also the dangers of interacting with the spinner dolphins that inhabit the cove. It was definitely a beautiful park. 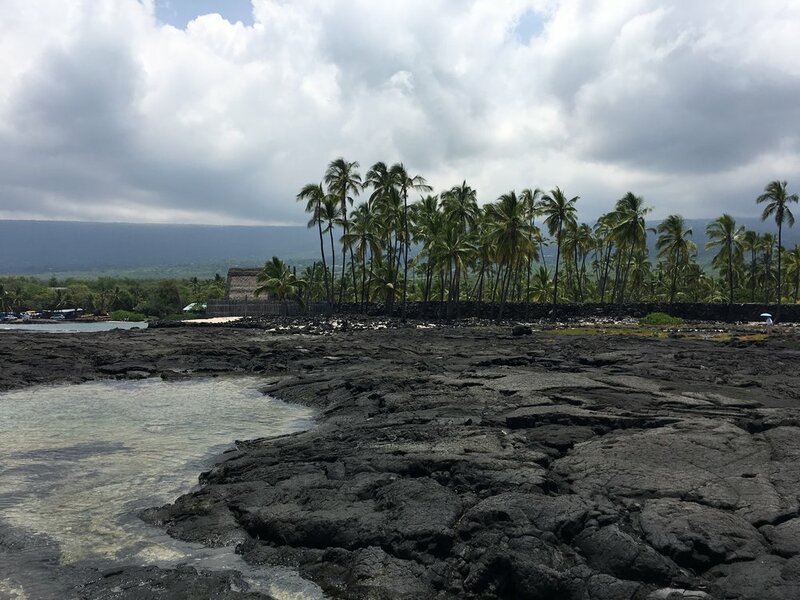 My next stop after driving around some neighborhoods and returning to the highway was Puʻuhonua o Hōnaunau National Historical Park. This smallish national park had a lot of historical relevance but as I walked around the park it was extremely hot. The sun baked down and the land was all lava rock. I hurried through this park quickly. By this time it was lunch time and the only place I found in the area (ok, I didn’t look too hard) was a gas station that had a kitchen. I wouldn’t recommend it so I’m not referencing it here. I then ventured down a road to the sea that led me to the Miloli’i community and the Miloli’i Beach. It showed me another side of Hawaii that you don’t see in the more touristy areas. I don’t think the locals in this area see tourists, like myself, in that part of the island. I didn’t spend too much time there but it definitely broadened my point of view of the island. I then ventured to the southern reaches of this island seeking out the green sands beach or Papakōlea Beach. The way this works is that there is a common parking area almost 2 miles away from the beach and there are locals that will drive you out and back for a fee. Well I was feeling strong and I figured the hike wouldn’t be too bad even though I was wearing flip flops. Well I set out and the hiking wasn’t horrible but it wasn’t good either. The path wasn’t defined and the terrain went from a coarse sand to out and out rocky. Neither is fun with flip flops. But I survived and made it to the beach and it was nice. It was a bit chilly but after that longish walk I needed to get into the water. After only being there a short while I made a deal with one of the drivers and he agreed to return me to the parking lot for full price. Ok, it wasn’t a deal but it was better than walking back. This driver was probably 15 (maybe younger) and he had only been driving this difficult terrain for a few days. But we made it back and I paid the kid. It was starting to get late but I decided to get to the southernmost point of the United States (and no that is not in Key West). As I ventured out to the lighthouse I encountered many men setting up fishing rigging and preparing to fish off the cliffside. It was very windy and a bit chilly as the sun started to drop in the sky. I made my way back up to the highway as the sun disappeared and then I was on a hunt to find a decent place to eat. I discovered Mehe's Ka'u Bar & Grill pretty soon after I got back on the many highway and I had a very enjoyable meal. It was a rather slow night and I got to chatting with the bartender (as I sat at the bar) and one of the local residents. After the meal I made my way back to the hotel which took longer than I was expecting after such a long day of exploring.